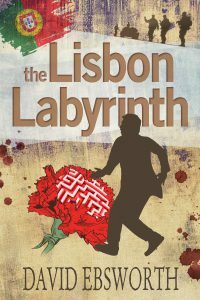 Journalist Jack Telford must hunt down a killer, solve a deadly riddle, renew his acquaintance with an old flame, and survive Portugal’s revolution in this taut thriller with a life-and-death finale, which Jack may survive, but only at great cost. Yet the story of the revolution is, in many ways, also the story of the music from Lisbon and Portugal that brought the country’s 40-year old repressive dictatorship crashing to the ground with barely a shot fired in anger. Portugal had a very fine entry in the 1974 Eurovision Song Contest – though it received only 3 points! But, late on the evening of 24 April that year, the song, E Depois de Adeus, performed by Paul de Carvalho, was played across the country’s Emissores Associados de Lisboa radio station as a pre-arranged signal for those involved in planning the revolution to be on stand-by. 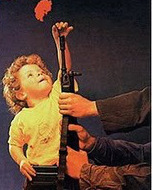 Then, twenty minutes after midnight (25 April), the radio station Rádio Renascença played Zeca Afonso’s song, Grândola, Vila Morena, to launch the revolution itself. During the night, troops sympathetic to the cause seized key locations and, the following day, forced the surrender of Marcello Caetano’s authoritarian government and its vicious PIDE secret police. 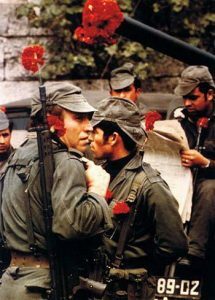 Over the next twenty-four hours, the people of Lisbon celebrated by planting red carnations in the barrels of the soldiers’ guns – so that it’s been known as the Carnation Revolution ever since. A dramatic piece of history, but one which will put Jack Telford in the gravest danger – whenever he’s not in one of the local Fado bars, of course! Click on the links to catch the YouTube clips.